"At Audi, we have more than 20 years of expertise in developing our sporty S models," says Professor Dr. Ulrich Hackenberg, Member of the Audi Board of Management for Technical Development. "From day one, our formula for success has been a combination of outstanding quattro performance, restrained design, and state of the art drive train, suspension, and infotainment technology. 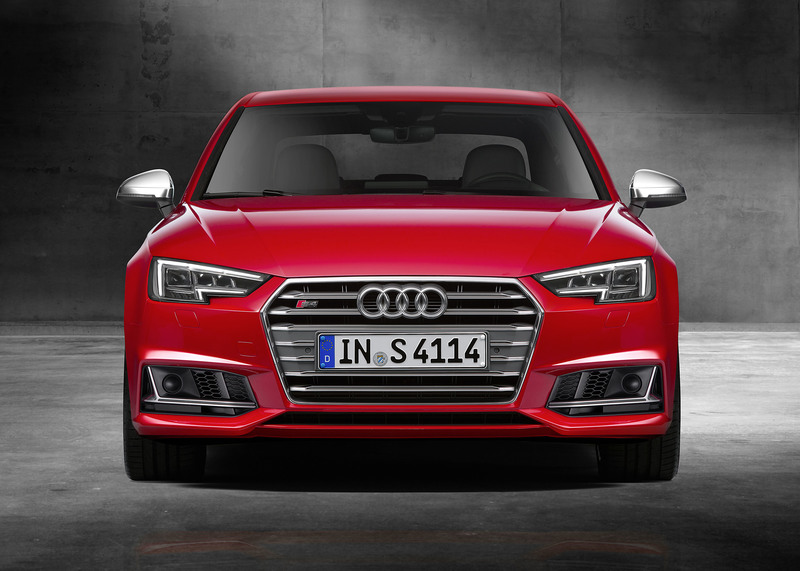 The new Audi S4 and S4 Avant impressively continue this sporty tradition." The heart of the S models is a newly developed V6 engine with petrol direct injection and turbocharging. The 3.0 TFSI has an output of 260 kW (354 hp); its 500 Nm (368.8 lb-ft) of torque is available across a wide range of speeds from 1,300 to 4,500 rpm. The engine outstrips its predecessor in terms of power and torque, while simultaneously offering significantly lower fuel consumption and weight. 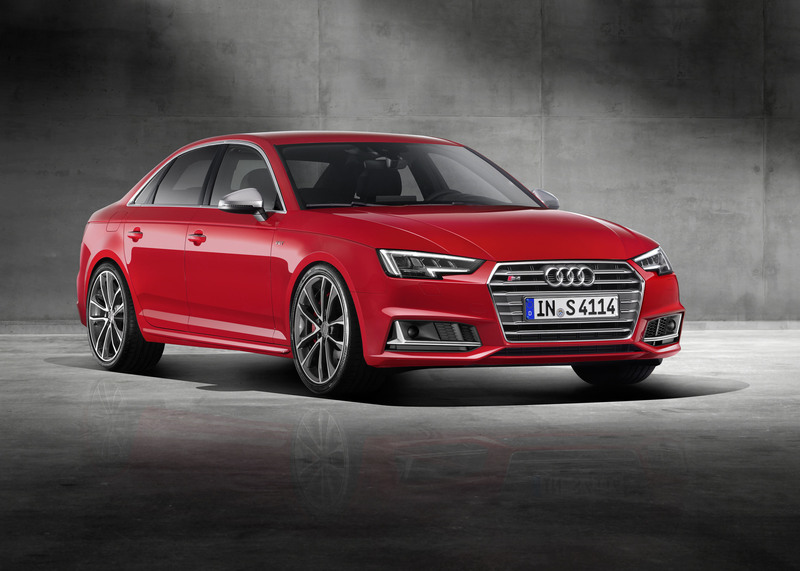 The engine can accelerate the Audi S4 from 0 to 100 km/h (0 to 62 mph) in 4.7 seconds, and the electronic limiter kicks in at 250 km/h (155.3 mph). Despite its considerably improved performance, the V6 is extremely efficient. In the NEDC cycle, the S4 Sedan consumes less than 7.4 liters of fuel per 100 kilometers with 170 grams CO2 per kilometer (31.8 US mpg [273.6 g/mi]). 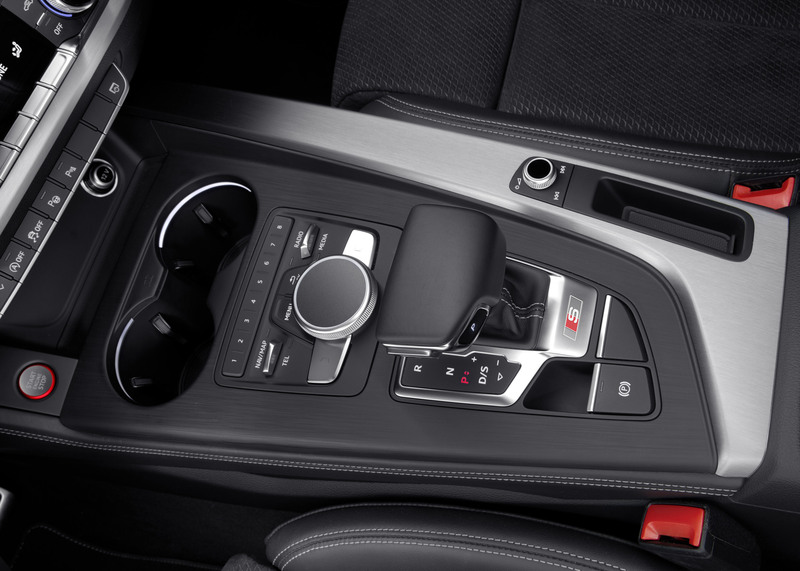 The new eight-speed tiptronic transmission is highly efficient and provides fast, comfortable and spontaneous gear changes. Whenever the driving situation allows, it switches to freewheeling to save fuel. 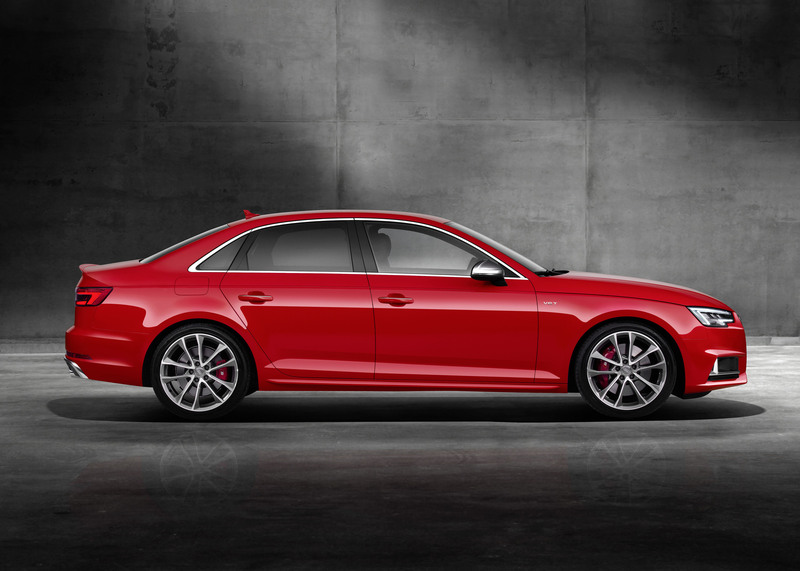 As on every Audi S model, the power of the 3.0 TFSI is transmitted to the road by quattro permanent all-wheel drive. During normal driving, the selflocking center differential funnels 60 percent of engine torque to the rear axle and 40 percent to the front. Depending on the operating situation, it can distribute up to 70 percent to the front axle or up to 85 percent to the rear. The wheel-selective torque control based on an intelligent software function rounds off the quattro drive train. For dynamic cornering, the wheels on the inside of the bend are slightly braked before they can slip. This makes handling more precise, agile, and stable. A sport differential available as an option improves the handling further by actively distributing the forces between the rear wheels. 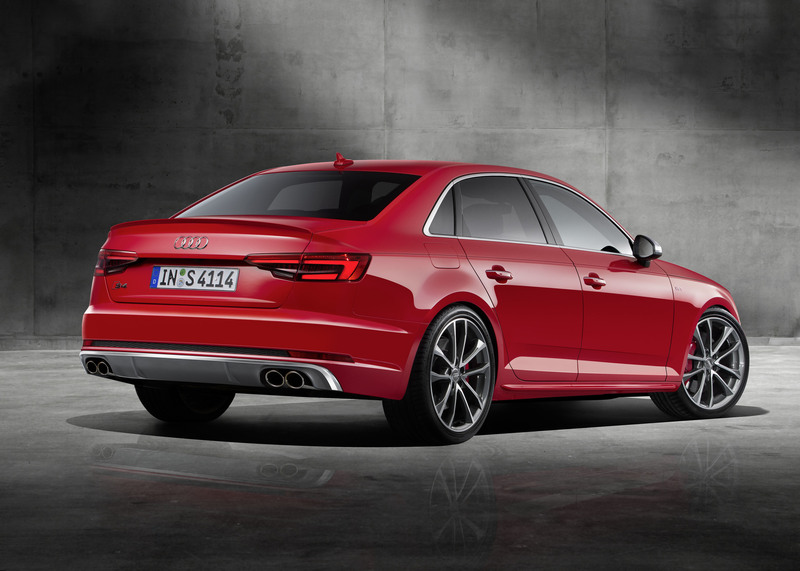 The new Audi S4 and S4 Avant handle corners of all kinds with aplomb ? whether on a racetrack or a mountain pass. For fast motorway driving, both models feature impressive straight-line stability. This performance is down to the newly developed suspension. The five-link suspension on the front and rear axle precisely separates the longitudinal and transverse forces, thus ensuring optimum handling in all driving situations. Like the electromechanical power steering, both are designed to be very lightweight. Variable speed-dependent dynamic steering is available as an option. The standard S sport suspension is 23 millimeters (0.9 in) lower than on the basic model. The ride height is the same with the optional suspension with active damper control. Along with the engine, steering, tiptronic and sport differential, CDC dampers (CDC = continuous damping control) are included in the Audi drive select handling system which comes as standard. This enables the driver to adjust the suspension characteristics in several modes. The standard 18 inch wheels in 5-twin-spoke star design roll on 245/40 size tires. A 19-inch alternative is available from quattro GmbH. Powerful, stable brakes are fitted on the large wheels. The appearance of the new S4 models is subtly understated. At the front, the Singleframe grille and the accentuated horizontal lines underline the width. The bumpers and air inlets are prominently profiled. Many of the add-on parts are painted in finely graduated matt gray tones, accentuated with chrome trimming at selected points. The exterior mirror housings in aluminum look are a visual highlight on the clear flowing side lines of the 4.74 meter long S4 (15.6 ft). 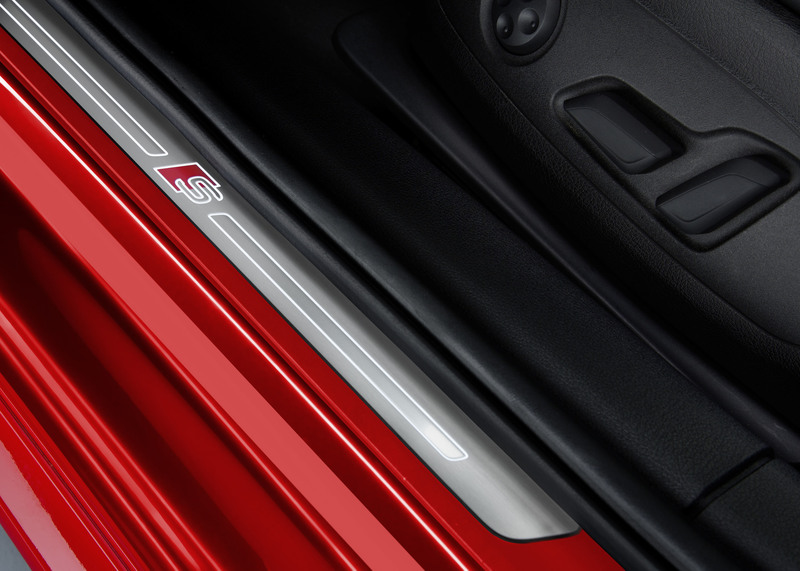 The strongly profiled sill trims also give both models a striking appearance. On the tailgate, a separating edge provides targeted aerodynamics. 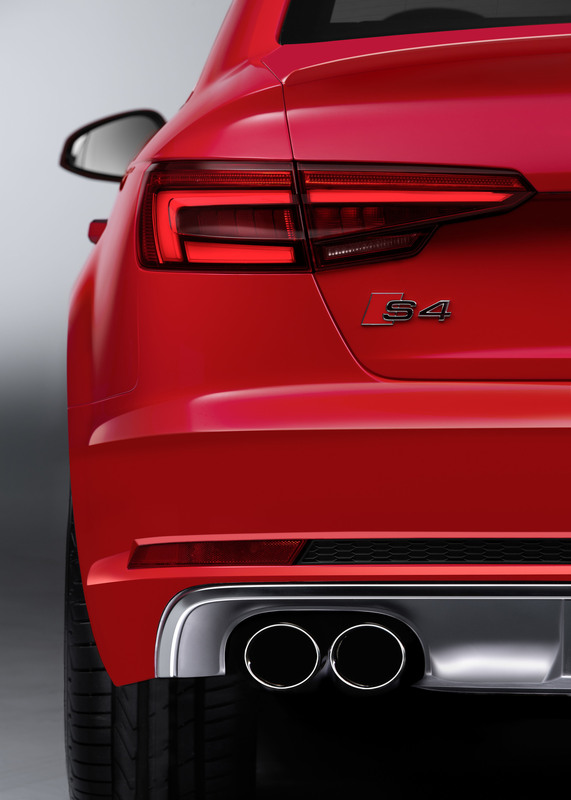 The S-specific rear bumper integrates a black honeycomb grille, an S-typical diffuser clip, and the four tailpipes of the dual-branch exhaust system. Intelligent composite construction characterizes the body. This makes it exceptionally torsionally rigid, safe, and lightweight. It is the basis for the low unladen weight of the car. The sedan with quattro drive as standard tips the scales at 1,630 kilograms (3593.5 lb), the Avant at 1,675 kilograms (3692.7 lb). The spacious interior can comfortably hold five passengers. The acoustic comfort sets new standards in the class, while the build quality is at a very high level. The Audi S4 Avant provides 505 to 1,510 liters (17.8 to 53.3 cu ft) of luggage space depending on the position of the rear backrests. 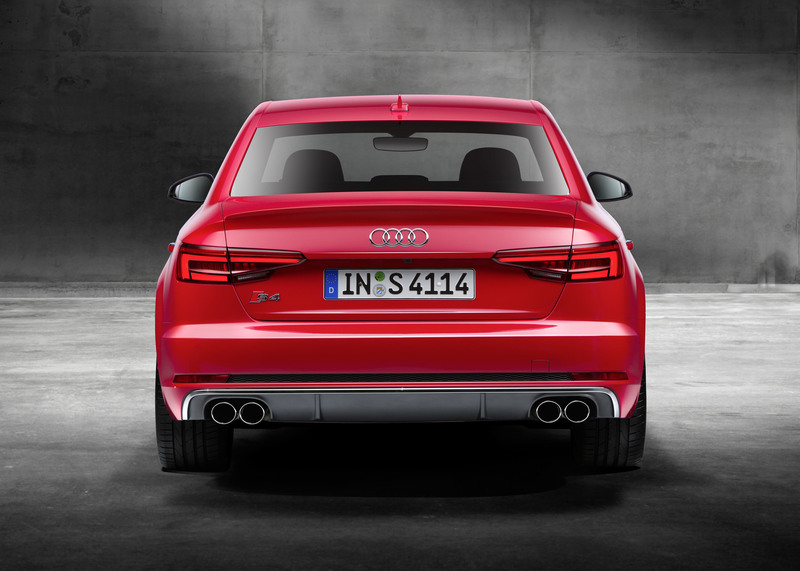 The S4 Sedan has 480 liters (17.0 cu ft) of luggage capacity in the trunk. The homogeneous styling with broad air vent strip on the instrument panel and integrated air conditioning control panel gives the interior a generous width. In darkness, LED light guides outline the profiles of the doors and the center console. The S sport seats are covered in a combination of pearl Nappa leather and Alcantara in the colors ebony, rotor gray and magma red. They have adjustable side sections, integrated headrests, and a pneumatic massage function. Typically for an S model, black is the dominant color in the interior. The standard inlays are made of matt brushed aluminum. 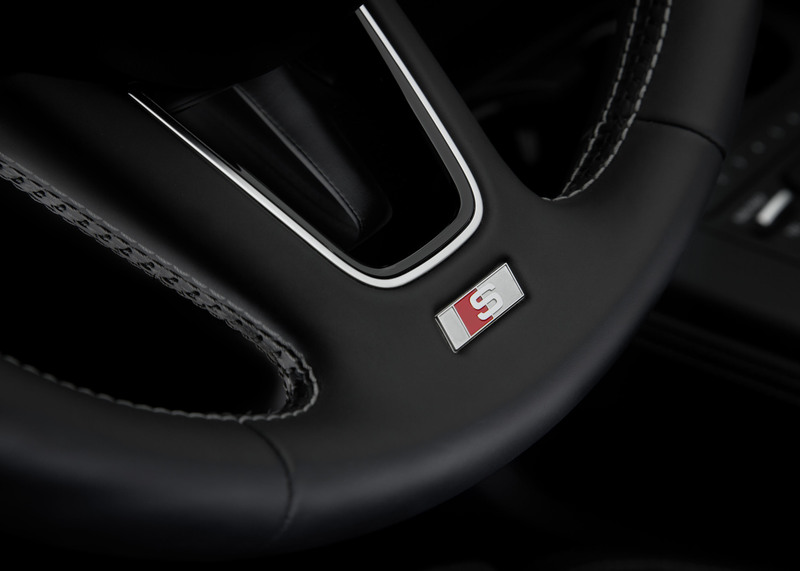 Details such as the illuminated door sill trims with S4 logos, the embossing in the seats, and the special S4 start screen round off the high quality equipment. 12.3 inch screen using detailed graphics. The driver can choose between three views ? one of them is an exclusive Sport screen, which moves the rev counter into the center. The second major innovation on the S4 models is the MMI operating system. Its operating logic is similar to that of the latest smartphones, including the intelligent free text search function. MMI offers the driver three operating methods: voice control, the new multifunction steering wheel, or the terminal on the center console. On the top infotainment system, MMI navigation plus with MMI touch and 8.3 inch monitor, the rotary pushbutton features an integrated touch pad for zooming and scrolling, and for entering characters. The MMI navigation plus is based on the processing power of the second generation modular infotainment system (MIB). This enables Audi to consistently bring the very latest solutions from consumer electronics into the car. Alongside the MMI navigation plus, the new S4 and S4 Avant feature the Audi connect hardware module. It provides a high-speed connection to the Internet using the LTE standard. The integrated Wi-Fi hotspot enables passengers to surf and send mail on mobile devices, while the driver can use the online services from the Audi connect portfolio. These include the Audi smartphone interface, which integrates iOS and Android mobile phones. The Audi phone box links passengers' smartphones to the on-board aerial. If the phones have the appropriate features, they can be inductively charged at the same time. The Audi tablet is used for flexible rear seat entertainment. Hi-fi fans can order the Bang & Olufsen Sound System with state-of-the art 3D sound. 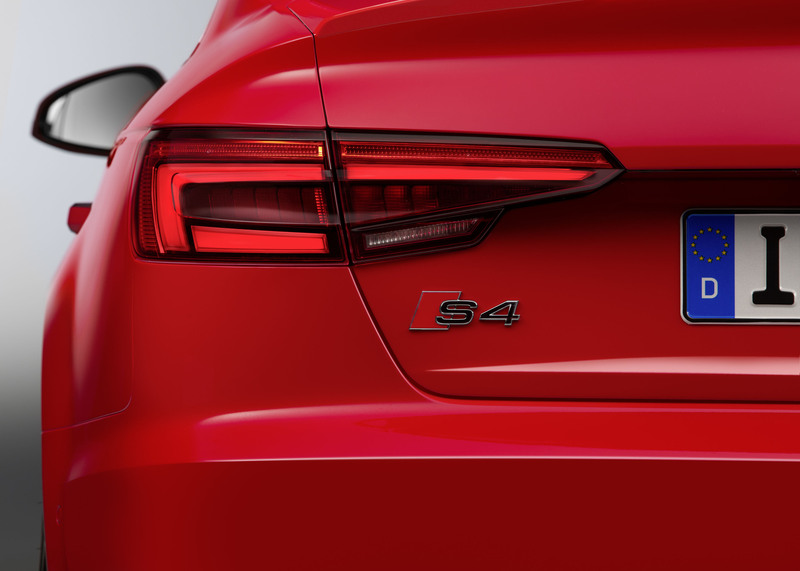 Both S4 models provide a wide range of driver assistance systems. The predictive efficiency assistant supports the driver in saving fuel, for example with gear change prompts. 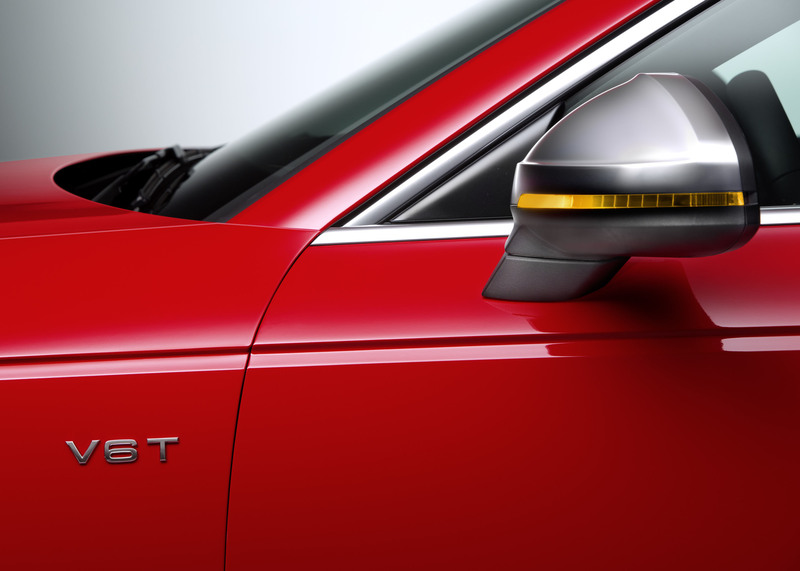 The Audi active lane assist helps the driver stay in lane. The adaptive cruise control Stop&Go including traffic jam assist can take over acceleration, deceleration, and steering up to 65 km/h (40.4 mph), easing the strain on the driver in heavy flowing traffic. Park assist, cross traffic assist rear, exit warning, collision avoidance assist, turn assist, and the Audi pre sense systems provide important safety features. A camera-based traffic sign recognition system rounds off the range. Even the standard equipment is extensive. In addition to the features already mentioned, for both body versions it includes LED headlights and LED rear lights with dynamic turn signal. The Avant features an electrically controlled tailgate and luggage compartment cover, as well as anodized aluminum roof rails. 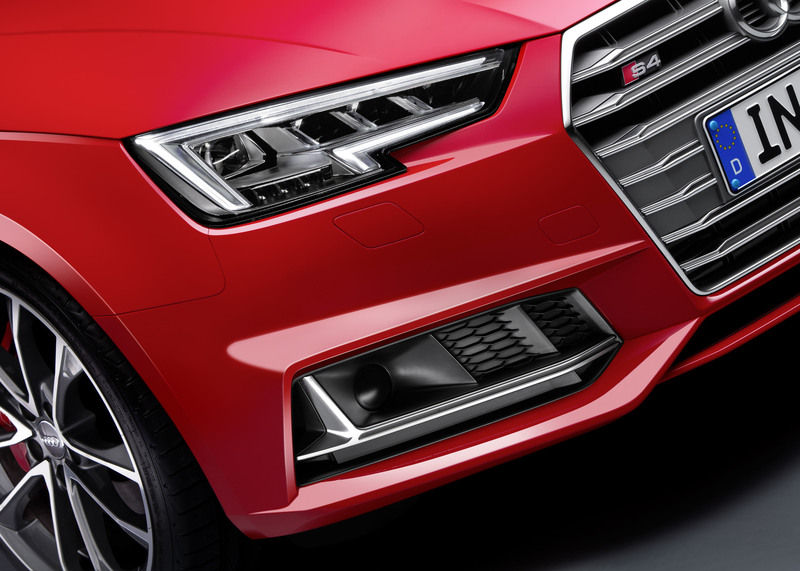 The optional equipment available underlines the high-tech nature of the new S models - for example, Matrix LED headlights, head-up display and sensor control for the tailgate on the Audi S4 Avant. 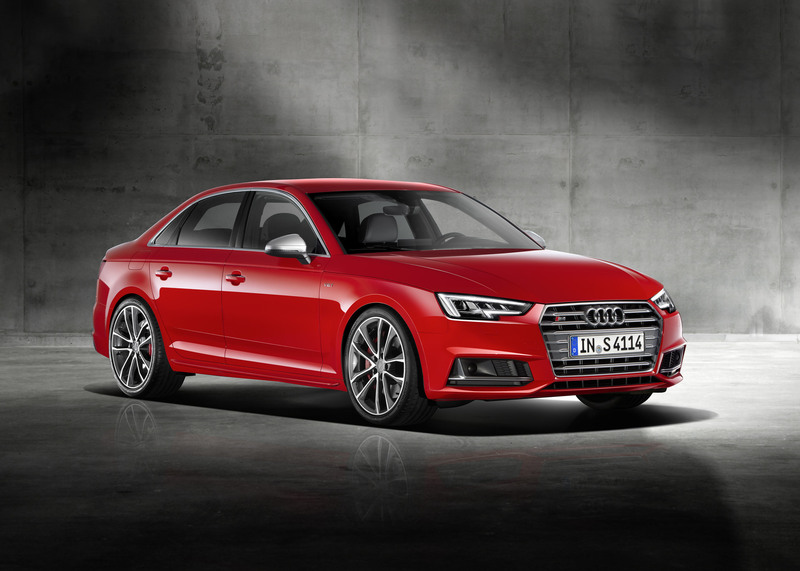 Audi will be supplying the two new S models from 2016.